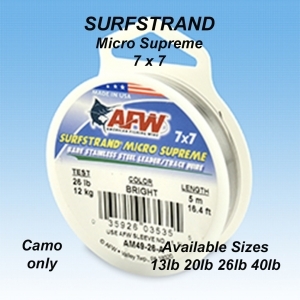 Miniature 49 strand Nylon coated with a tough but durable coating. Very limp and has virtually no memory or stretch, giving a life like presentation. Available in 20lb 26lb 40lb bs, 5mt spools. NOW AVAILABLE IN 13lb bs SPOOLS. For those really shy feeding fish!!!!!!!!!! !